In several social media contexts, the topic of how to search has been touched on; status posts, in my opinion, don’t seem to be adequate for responding to such topics so here is a general review of my method. First, find a genealogy software program where you can record your results. When I began, my only desire was to have a searchable copy of my daughter’s database, which meant free was the major criteria. We found Legacy’s description to be reasonable, downloaded the program and loaded a gedcom of Kay’s database. Over time, I have expanded what I do with our family history information, including becoming primary researcher on my paternal line, and I have upgraded to the Deluxe Legacy, which I continue to use and find quite functional. Second, begin building a tree on Ancestry.com. I know that many experienced genealogists see no reason to have a tree on Ancestry, but I do not agree. I also do not see a reason to make the tree private; living people are, by default, private. I’ve read others’ frustrations that they don’t want others to be able to take their hard-fought for research, but for me, I would rather have my hard-fought for, accurate and thorough research available for others to utilize to hopefully cut down on erroneous information on trees, which is one of the reasons people give for not putting up a tree. Here are a few reasons why I have an Ancestry public tree: the tree itself is free [it’s only researching on Ancestry that requires a fee] and others can be invited to view your tree in capacities of your choosing – Editor, Guest, Contributor, and with limited or unlimited ability to see what is on the tree [for example, living people], etc. [it does require they get a free Ancestry log on account but the tree is fully searchable by your invitees]. People with Editor status will have access to your tree after your death so there is a way your research can continue to be available updated and available to your family. A public tree on Ancestry is available for others searching, which means your tree can be found by potential relatives, which may further your own research [Randy Seaver refers to the tree as cousin bait]. Ancestry is most useful with a paid account because of their large collection of records, databases, images, stories,etc. Each of the databases or images you find can be linked to the individual on your tree, which makes a handy cloud-based storage retrieval system for such documentation, thus avoiding the need for complex filing systems in binders, file drawers, or on your computer, external hard drives, Evernote, and personal cloud storage. I also have public trees on FamilySearch, My Heritage, Geni.com, etc. [to provide accurate information and work as cousin bait] but none of those have an interface that can be seen in ways I prefer. For me, a database and Ancestry are the basic tools for recording what I find. Ancestry.com has provided many training videos to help people search their collections: here’s a link to a seven-minute video on how to search. Many other tutorials are available from their YouTube channel. This link takes all the details (birth, death, family members, residence locations) I have entered and fills in the search screen for me. I still have options to refine my search as I wish, but I don’t have to enter the basic search information every time I search again. Search results appear on two different tabs: Records and Categories. I generally begin with census records because those records provide information on the person and the family over time, which provides a framework for how and where to search for every other record. I have noticed that many of the family trees have no attached records or perhaps only one census. But without utilizing every census for the whole family [parents, siblings and children] you will have an incomplete picture and, perhaps, even an erroneous one – it is all too easy to find a person with the same name, general age and location and, without the verifying information regarding extended family over time, you may end up on the wrong track. In the early stages of your research, it is probably best to begin with the most recent census for your target person so you have the most accurate information from which to evaluate the record. Because there are few records available before 1940, the best results will be for those born prior to that time. If the person I’m searching for died in, say, 1934, I would begin with the 1930 census, recording in my database management program all information from the census on every person listed in that household – name used [including spelling of surname because it will likely vary through the years], age, birth location, occupation, etc. can all be used as clues in other searches. The information asked for varies from census year to year, so learn what you can from each one. The 1900 and 1910 censuses asked about marriages and the number of children. This information can be quite useful, so don’t overlook it. For example, if the mother in the family lists herself as having been married for 7 years and is the mother of 5/3 children, and there are eight children listed in the family, some of which are older than seven, that mother is not the mother of all of them.Take the time to think about what you already know about the family and what you can learn from the new information. You may be able to infer from the list of children still living which children may have died as well as the decade in which they died. Please note that the accuracy of census information is dependent on many factors including who was giving the answers and how much they actually knew [for example, the information may have been given by a neighbor or the mother-in-law] as well as the quality of the enumerator in terms of spelling ability, attention to detail, and recording details based on hearing, as well as the attitude of the family toward allowing the government to ‘know their business.’ For all the reasons a census may contain errors, the consensus of the information over time should provide a more accurate picture of the family. For example, a child may be listed as being 9 in the 1920 census, which would put their birth at about 1911, but they may also be listed as being 1 in the 1910 census, which would put their birth at about 1909. In this case, the 1909 birth has to take precedence since it is not likely the 1910 listing was precognitive. Tombstones may or may not be a reliable source for birth or death information; I have seen some of those with birth dates later than the first census in which the person was recorded – some headstones have been added later by well-meaning family members but may have been based on that one erroneous census age. Our long ago ancestors may have been unsure of their own birthdays – just this week I found a pension file where my ancestor listed his own birth date with the clarification of “I think it was …” When asked if he had any record of his birth he noted he had his father’s Bible in which the names and birth dates of the children were recorded. If they were fuzzy about their own birth dates, why should it surprise us if census records and tombstones show variability in recording those dates. Take note of other names on the census page and review a couple of census pages either side of the target census page to see if family members are nearby [this is more important in earlier censuses when extended family was often nearby versus later censuses in more urban areas where family members are less likely to be seen within a few pages of one another]. Once I have extracted all the information from the census to my database including documenting the source for the information, I save it to my tree – note the far right side of the graphic below to see the location of the save button. Prior to 1880 people have to be attached individually, but from the 1880 census forward, all family members should be savable to the tree once the information box has been checked – I verify this because occasionally the way family members have been indexed causes a person to be missed. Source Citation: Year: 1940; Census Place: Beaumont, Jefferson, Texas; Roll: T627_4076; Page: 2A; Enumeration District: 123-24. Ancestry.com. 1940 United States Federal Census [database on-line]. Provo, UT, USA: Ancestry.com Operations, Inc., 2012. Original data: United States of America, Bureau of the Census. Sixteenth Census of the United States, 1940. Washington, D.C.: National Archives and Records Administration, 1940. T627, 4,643 rolls. Generally speaking, in basic searches on Ancestry, I usually will see pertinent records within the first dozen or so. If I do not see records that seem pertinent to my individual, I refine my search or work with specific categories or census years to narrow the field. If there are others who have done research on my person, there will likely be hints or ‘shaky leaves’ [records that have already been attached to a person of similar name, age, location, etc.]. In the upper right hand side of a person’s page in the tree, there may be a listing of such hints – I click on that button and review and utilize the hints. 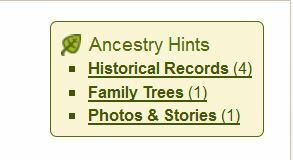 The above button is for a person in my tree [distant relative I have not worked on yet] that shows four historical records, one photo or story, and links to other family trees. The records links are to the 1940 census, two city directory listings and an obituary [in this case, the obituary link is no longer valid]. The photo/story is a photo of his death certificate.In this listing of the hints, the three links that work are for my person; please be aware, however, there are frequently hints that are not for the target person. For example, one of the fellow researchers in my family had found a marriage link for a person, which then showed up as a hint in mine; the ancestor had the correct name and age and was living in the expected county. The person who linked this had not gone further with the clue [because it was not a direct line person]; however, I rarely stop there. I added the wife’s name and searched for the next census record following the marriage and discovered in the next census record [and additional years] that this person was a different race from the expected family – this is because I note each bit of information from each record. I searched subsequent years because race is not always a reliable factor in any given census – I think sometimes the enumerators may have not have filled in that column as they recorded the information but went back later and dropped down the information from the previous families on the page, failing to remember there was a family of a different race within that area. By using that marriage record as a clue and searching for other records, I learned that hint was not accurate. I then contacted my fellow researcher regarding what I found so they could update their own research which, after thanking me, they did. The next aspect of the hints are the other family trees that are purported to have my person in it; in this case, there are five, each of which can be reviewed for clues. I do not ever copy others’ trees into mine; I do sometimes review a specific person for clues that may be traceable for my purposes but record information only after I have completed searching for documentation myself. If I find nothing to support that clue, I merely note the name and source of the clue in the research tab of my database program. Please review the other trees carefully because they may be completely and obviously different people or they may be an interesting compilation of several people. On the other hand, there may be clues even in an erroneous tree. Once I have exhausted all the reasonably easy-to-find documentation on Ancestry, I search FindAGrave [currently those may also come up as hints on Ancestry]. FindAGrave can be a great source of information. The person putting up a memorial may have included headstone photos, pictures of the person and/or family or death certificate, biographical information, and links to other family burial locations. I retrieve all available information for the person and every person linked to his/her memorial [again using them as clues to be verified and noting FindAGrave as the source]- and those linked to the linked person as appropriate to my tree. Depending on the amount of detail, this can be fairly involved. Based upon my relationship to the person and/or the location, I may also click on the cemetery name and search for that surname or other surnames from the location. Next, I go to FamilySearch.org to search for any documentation or records not yet located. Different websites search differently, so play around with search information. In my experience, it does not search well from the woman’s name so I generally begin with the husband’s name and the spouse’s name with age and location parameters. Try it every way imaginable because each search string may come up with different information. If searching for a female, I will usually switch out her surname to encompass any records that may be indexed only by her name at the time. Sometimes a search for a name with no other parameters will provide results not seen when more information has been given. Experiment! If I am having a particularly difficult time finding a specific census year for an individual, I also utilize my library’s database collection, which has access to Heritage Quest. This contains census records for 1790 through 1820 and 1860 through some 1930 censuses. Again, it searches differently – exact matches only by using alternate spellings in subsequent searches – and I have occasionally found a missing record. It also permits searching by first name, within age parameters, locations, etc., which again can be useful. Because their images are not quite as clear as those on Ancestry, I would note the information from the District, page, and family number and search for that record by browsing the collection on Ancestry, which means, once found, I can then attach the record to the person on my tree. If I am still having difficulty, I may search for the surname in the known location and browse nearby pages to see if they have been mis-indexed. I once found a missing census for a Buckner who had been indexed as a Ruckner. This particular census held a lot of clues that paid big dividends so I was rewarded for taking the time to do a page-by-page browse. Heritage Quest also has Revolutionary War Records where I recently found a 13-page pension file for a GGGGgrandfather, again with much information, including his signature. My library database collection includes access to Fold3 and I search that for military records, if they did not come up on Ancestry [particularly Civil War records when the age and/or location makes it likely they may have served] or a 1930 census if it has proved to be difficult to locate; Fold3 search is often more successful for the 1930 census. Once I have gone through all these websites, I begin to search the internet. Ancestry has a prepared search string that can be accessed by clicking the link at the bottom of the person’s page – it utilizes variations of the person’s name in multiple orders and with and without wildcards. Legacy also has search strings, but it is geared to specific sites and the Ancestry string is geared to whatever search site you have as a default. I have also used Mocavo.com though I opted not to utilize their paid service. I have rarely found anything that did not also come up on the searches of other browsers. Following all this specific to the person research, I next search the Internet for genealogical information for the county/state(s) in which my ancestor lived. There is a huge amount of variability in those websites – some offer next to nothing while others are total goldmines. For example, the Fayette County, Alabama rootsweb site has a cemetery listing that includes links to every cemetery in the county – they include cemetery photos and names of the people buried there (up to the last cemetery survey, which may be fairly far in the past but still helpful), but they’ve gone one step further by doing an every name index of every person in the county cemeteries (again, at the time of the last survey). It’s rare to find an every name index for a whole county, so this is a real treat. Another goldmine is Wise County, Texas where they have indexes to all the older births (by both surname and mothers’ maiden names), deaths and marriages . Cyndi’s list contains lists of resources by state and county so check her out and see which ones are the most useful for your purposes. Old newspapers are the most entertaining of the information I have found, but I wait to search for those until I know, by way of other documentation, the locations to search. Again, there is a huge variability in what is available and how to search for it and Cyndi’s List offers loads of sources for newspapers to review. Some of them are fee based and some are not. For my hometown, my library database provides access to the archives of the local newspaper, which I do utilize. Our Oklahoma Historical Museum has partnered with others to provide funding for the digitization of newspapers and periodicals and those images are available for searching. Many universities and state archives have digital collections so explore and see what you can find. Some of the interesting tidbits we’ve found in newspapers include the marriage announcement for my grandparents, a front page account of a little girl’s birthday party my uncle attended [he was listed as ‘Toodles Lineberry’ and when I asked my mother who Toodles was, she replied, “why, George, of course”], a front page note that my aunt, when she was five, got lost and was found crying but returned safely home. There have been a number of newspaper notes indicating my great-great uncle was quite a character [he was an attorney described as having a heavy unkempt beard with tobacco spittle on it; he was sued for striking a journalist; his wife almost died from accidental? poisoning, he had practices in Utah, Idaho, Montana, and Colorado, ran for public office, etc.]. These newspaper items have boosted him to the number one position of ancestors we most enjoy searching for – and he’s not even a direct line ancestor, just a brother of my great-great grandfather. There are websites with digitized books that can be searched for surnames, locations, occupations, etc. My library database includes WorldCat as a place to search for respositories of books and some of those may be in nearby collections. Explore the possibility of interlibrary loan, but know that many of the books may be rare and available for in-library use only. I also have searched for currently living descendants by name on Facebook and Google+ and have established connections with several by this means. One of the extra benefits of this is that many of these people post photos of family members – perhaps a picture of grandparents on a birthday or anniversary. I have also searched online phone directories for descendants. For example, I called a descendant of one of my great-grandmother’s brothers. They were out but returned my call once they got home. They had an interest in the family’s history and were delighted to hear from me; we have since emailed several times and they sent me a very old photograph album for my daughter to scan and return. Because new record collections are being added and more newspapers are being digitized and more people are writing family history blogs, continue to search for family members on a rotational basis every few months to see what else may be available. For the past several years, my daughter and I have taken research trips to be able to photograph cemeteries, home sites and the locations where my ancestors lived and to research the record repositories that may be available only in the county or state where they were created. We have found many records in that way, but I am pleased to live in the digital age where we can limit our location research to what is as yet not digitized and searchable. Finally, I have a blog in which I write about my research findings and my research questions – maybe someone out there has an answer. The blog puts the information out in story form, which I tag with key words to aid family members in finding the story so they will hopefully find it and comment – more ways to connect with family I don’t yet know and to pick up additional information and clues for my next round of research. It’s a good thing I enjoy solving puzzles and tracking down minute details because that is clearly what it takes to answer questions of family history and lineage. There are any number of difficulties or crazinesses in historical records that can stymie a search. Problems as seemingly insignificant as spelling and penmanship; or use of first names, middle names and nicknames in censuses from one year to the next; or moving from location to location; or misrepresented birth dates/ages can make the search more difficult. I’ve been searching for information on my great-grandmother’s brother, William Rufus Buckner, off and on for a couple of years. I’ve had a particularly difficult time finding information on him even though I’d discovered him early on in Wise County, Texas in the 1910 census. Because Ancestry.com searches broadly in terms of surnames, ages and locations, you can sometimes find records you wouldn’t otherwise pick up. On the other hand, because it’s so broad you often have too many to take the time to look through. Heritage Quest searches way too specifically [not even an option for a wildcard] and there is no way to account for those flukes in spelling, age or location other than in specific searches, many of which you could not even hazard a guess. He was born in about 1858 as the second child of John and Nancy M. Foster Buckner [as to the search for verification as to who Nancy was, see previous blogs on Surname Saturday – Buckner nee Foster and Follow Up Buckner nee Foster. His father had joined Company I of the 41stAlabama Infantry and died in Tennessee as a result of illness. Some men have 12 and more status cards in their files while John only has five, one of which is made out for James, but since the information is generally the same as that for John, the archival people have filed it with John. Even the cards have differing information on them; two (one Jno, usual abbreviation for John, and one Jas) indicate he died September 18, 1862 while one (John) states September 12, 1862, although all three have the location as Charleston, Tennessee. A transcription of a card that is not visible on Footnote is available at the Alabama Department of Archives and History website shows Nancy filed for a widow’s pension. 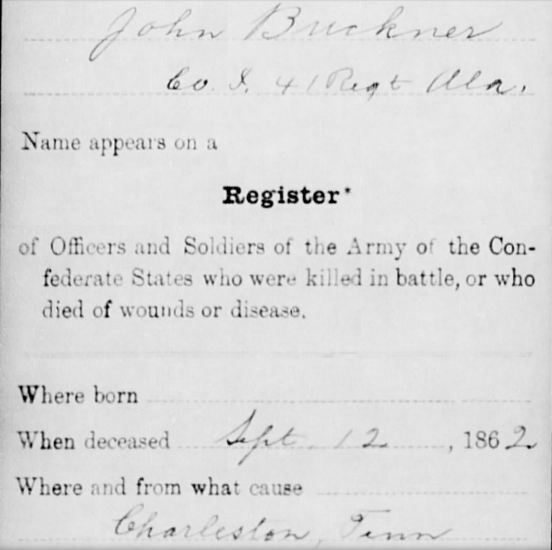 There was a similar notation on the card for John’s brother, Jesse W. Buckner, that John Buckner, father, had filed a claim (which had been mailed to Blount County). BH Williams was the probate judge for Fayette County at the time, presumably a copy of the documentation would have been at the courthouse had it not burned. I had hoped to see application papers when we visited, but nothing was available, apparently both claims for monetary support were denied, perhaps because both deaths were from illness rather than battle injuries. At the time of the 1866 Alabama Census, he and his mother and three siblings [Mary Jane, Sarah and Medora] lived in the vicinity of his grandparents [Anthony Edward and Mary King Foster]; uncle, Anthony Edward Foster; future brother-in-law, James Franklin Willis; and long-time neighbor Joshua Watson and his family. A website listing Fayette County marriages listed a marriage for Nancy Buckner to Joshua Watson in 1868 and cemetery records confirmed the death of his wife Phoebe in 1867. The 1870 census listed Joshua and Nancy and four Buckner children plus their first child, John B. Watson. As usual, there was a dilemma with that record. Mary Jane, who would have been a 14-year-old female at the time, was listed as M.J., a 12-year-old male, but since Mary Jane married two years later in the home of Joshua Watson, there did seem to be a connection between them. I had a difficult time finding any record on the family for quite some time, but eventually found a census record for Holly Springs, Mississippi that showed Joshua and Nancy and their son, John B. Watson, plus three additional Watson children born after June of 1870. Mary Jane had married James Franklin Willis by that time, but the remaining Buckner children were also there in Holly Springs having been listed by the census enumerator as Rufus Watson, Sarah Watson and Dora Watson, which was why I’d been unable to locate them. I’d been unable to locate Nancy because the enumerator had listed her age as 60 instead of 42. With the discovery of a marriage record for William R. Buckner and Martha Ann Holliman for 1892 I was then able to track him to Wise County, Texas in 1910 with two children, Grover C. and Lona Belle. 1910 Census - William R. & Martha A. Buckner with Grover C. and Lona B. Buckner in Wise County, Texas. So far, the listings for William Rufus had been: William Buckner for the 1860 census; R. Buckner for the 1870 census and Rufus Watson for the 1880 census. The 1910 census was for William R. Buckner with a wife named Martha A. Buckner who had been married 17 years [corresponding to the 1892 marriage record] and had two children. The bad news for that is that it makes the searching more difficult; the good news is I picked up both first and middle names for him in the process. After many searches, I finally located a 1930 census for Rufus in Oklahoma where he was living with a son I didn’t know about – Vester. This listing was for Rufus R. Buckner. This son’s age would put his birth at about 1888, which was four years before the marriage of Rufus and Martha Ann, which led me to a further search of Fayette County marriages. 1930 Census - Vester Buckner with his family, father-in-law, and father, Rufus R. Buckner in Tillman County, Oklahoma. I, of course, now had a time frame for the death of Martha Ann – before 1930. 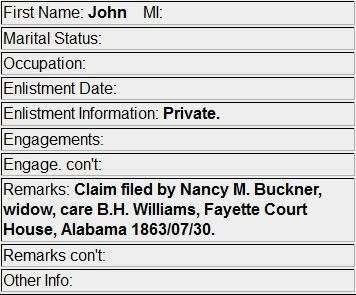 I searched for and found an earlier marriage between Rufus Buckner and A. J. Collins that took place in 1883 in Fayette County, Alabama. The fact that Rufus married again by 1892 would indicate A. J. died before that time and that Vester was the child of Rufus and A.J. I found no other records for Vester Buckner. However, by tracking the children in that 1930 record, I found other records that added the initials G. S. to Vester’s name – I thought Vester could be short for Sylvester but I found nothing to support that. With the 1890 census being burned, the 1900 census for Rufus would certainly be a help in adding to what I knew about him. Last month I found evidence of some Buckner burials in the Frederick Cemetery in Frederick, Oklahoma; unfortunately, when I sought to find them on the transcription of that cemetery, all names from Br to the Cs were missing. I sent an email to the website administrator who said she was a new administrator but would ask the previous administrator. That person looked and was surprised to find my observation to be correct and he supplied me with an Excel spreadsheet of the missing people where I found not only the Buckner people I was looking for, but I found that elusive Rufus Buckner listed as well. 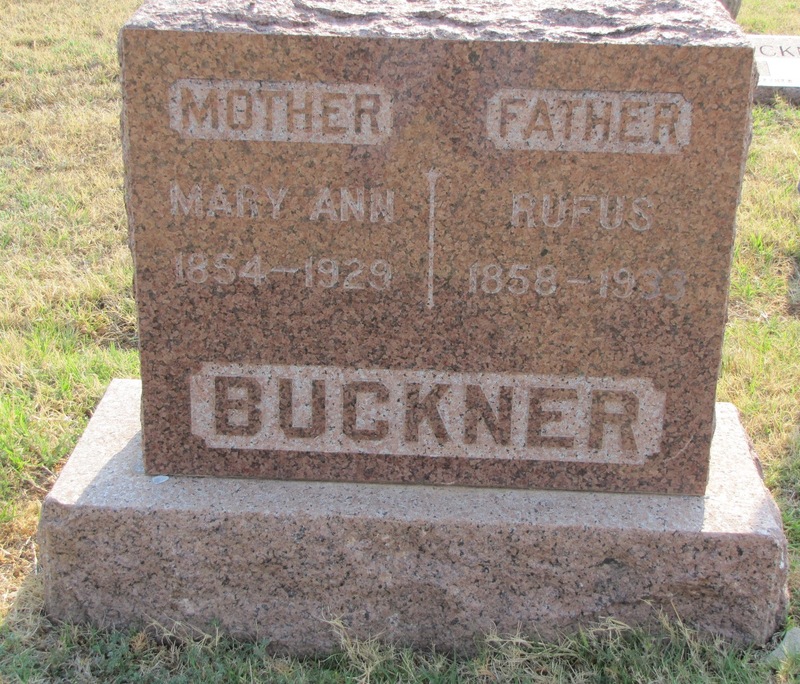 Although I didn’t find his wife, Martha, I was a little suspicious that a Mary Ann Buckner who died in 1929 [before the 1930 census] and buried near him might be worth a closer look. My daughter, Kay, and I took a trip to Wise County, Texas and over to Tillman County, Oklahoma in April to see what records and burials we might find. We found the headstone for Rufus to be a double headstone with his wife, Mary Ann – back to that confusing use of nicknames. Apparently any number of females with names beginning with ‘M’ went by Mary, while those whose name was actually Mary often went by Polly or Molly [or Pollie or Mollie]. Yesterday I decided to return to the Heritage Quest site and search for the first name of William in both Oklahoma and Texas. Obviously there were going to be a lot of Williams in Texas – too many to look at as well as the possibility of having to search for Wm, Rufus or a combination of initials. I set limiters of an age range and being born in Alabama and hoped the census enumerators had been reasonably accurate for a change. I began by selecting Williams who lived in Wise County, Texas and found a William R. Ruckner. I was rewarded with a correct hit on that one. Even though Ancestry.com searches broadly, it would never have tried a substitution of Ruckner for Buckner, even though they rhyme. This record provided verification that the 1930 census relationship with Vester was a correct one because the 1900 census listed a son born about 1888 – Guy S. Buckner [further research found Guy Sylvester Buckner in the California death index], along with Grover C. and Lone B. Buckner [close enough for the spelling capacity and/or penmanship of the census enumerators]. There was also a bonus of another son I hadn’t yet discovered, John H. Buckner, born about 1884 – a whole new thread to pull. 1900 Census - William R. & Martha A. Ruckner and John H., Guy S., Grover C. and Lone B. Although that record gave me new information and corroboration, it also created more questions. For example, to the question “Mother of how many children,” Martha Ann answered 5 and noted that all 5 were still living. Based on marriage records, only two of the four listed children should be Martha’s and since the marriage record listed her under her maiden name it is not likely she had three children from a previous marriage who weren’t living with her. On the other hand, since A. J. died when her sons were quite young and Martha would have been their mother for eight years, she may well have responded to the question in terms of caretaking. However, it’s more difficult to wipe away their response as to the length of their marriage – 18 years instead of the 8 expected from their marriage record. Based on what I’ve seen of enumerator’s accuracy in census records, perhaps Martha or Rufus replied eight years to the question, but since the oldest child was sixteen, the enumerator decided he must have not heard the whole answer and filled in logically with eighteen. Fortunately, I have the 1910 census that indicates their marriage was of 17 years’ duration rather than the 28 I might have expected if I hadn’t had the 1892 marriage record along with the 1910 listing of years of marriage. After yesterday’s find of the 1900 record I have a new child I was unaware of to research. Additionally, any way I look at it, I’m still missing a fifth child who was alive at least as long as 1900, one most likely born between 1885 and 1891. Fortunately, I really enjoy the hunt itself, so back to work.